Current: THRILLING ADVENTURE HOUR... SPARKS NEVADA: MARSHAL ON MARS #1—Two variants revealed! THRILLING ADVENTURE HOUR... SPARKS NEVADA: MARSHAL ON MARS #1—Two variants revealed! Ben Acker and Ben Blacker’s all-new series inspired by the hit Nerdist podcast Thrilling Adventure Hour to be titled THE THRILLING ADVENTURE HOUR PRESENTS… SPARKS NEVADA: MARSHAL ON MARS featuring a variant cover by Jamie McKelvie and a photo variant of both creators in retro Thrilling Adventure Hour style. 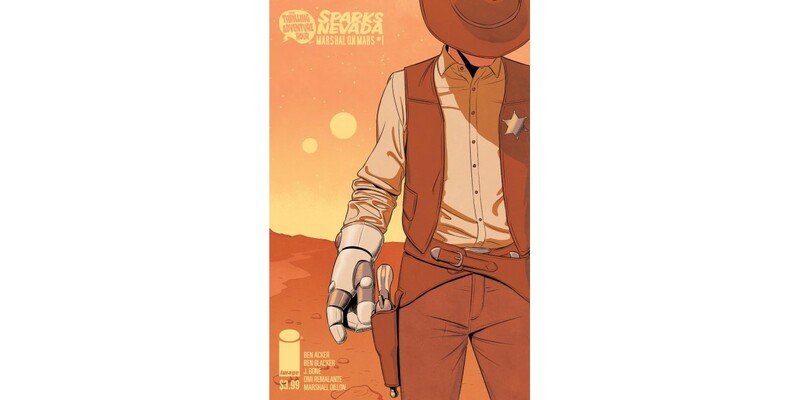 In SPARKS NEVADA: MARSHAL ON MARS #1 you’ll want to shine your astro spurs and don your robot fists! Justice rides a rocket steed across the crimson plains of the fourth planet, where one man brings fear to robots and aliens...and hope to humans who make this frontier planet their home. He is...SPARKS NEVADA: MARSHAL ON MARS by Acker & Blacker, J. Bone, Jordie Bellaire & Marshall Dillon. THRILLING ADVENTURE HOUR...SPARKS NEVADA: MARSHAL ON MARS #1 will be available on February 18. Cover A can be ordered with Diamond Code DEC140625. Cover B by Jamie McKelvie can be ordered with Diamond Code DEC148194. Cover C can be ordered with Diamond Code DEC148195. The Thrilling Adventure Hour is a staged show and podcast on the Nerdist network in the style of old-time radio in which actors you know and love from television, comedy, animation, and film dress nicely and enact all manner of genre-based comedy segments. Created by Ben Acker & Ben Blacker, the show features the WorkJuice Players and a wide array of special guests. Past guests have included Nathan Fillion, Patton Oswalt, Alan Tudyk, Jason Ritter, Neil Patrick Harris, Ed Helms, Joseph Gordon-Levitt, Zachary Levi, Alison Brie, Danny Pudi, Chris Hardwick, Molly Quinn, Andy Richter, Patrick Warburton, Dave Foley, Colin Hanks, Adam Baldwin, Amber Benson and more! The Thrilling Adventure Hour also boasts an Eisner-nominated graphic novel (Archaia Entertainment/BOOM! Studios) and a new web series on the Nerdist Network.